Want to connect Snap-Lock Black Steel Stovepipe to a stove with an oval output? Then you need an Oval to Round Boot Stove Connector. Is the oval opening on a wood stove measured from the inside or outside? You would normally measure the interior dimensions as your adapter or starter piece will push down into your flue collar on stove. Is it supposed to fit on the outside of my oval outlet from the stove? It is meant to fit inside the trim collar on your stove. How is this installed? Does it fit by pushing up into oval? That is correct, it would be installed male end down into the stove. How long is the adapter? 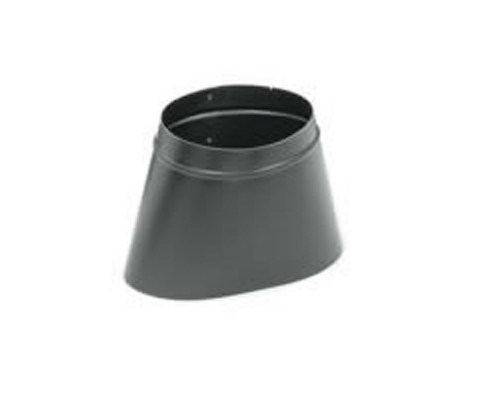 How big is the oval of this Snap-Lock 6 inch black steel stovepipe oval to round boot stove connector? The oval is 8 1/4" x 6 3/16". What is the size for oval discharges? This oval-to-round adaptor has an oval end measuring 8 1/4" x 6 3/16". What is the width of this adapter at the oval? The oval end of this adapter is 8 1/4 inches in width by 6 3/16 inches in depth. Will this work for a wood stove? Yes, but please note that the oval end of this piece measures 6" x 7" and compare that to the dimensions of your oval opening. If it will not work, you will probably need to call a local sheet metal shop or fabricator to customize a piece for your stove. How big is the oval? The oval end on this piece measures 7" x 6". Searched extensively for this item, you had it. Fit perfectly. Will use you for ALL my piping/stove needs. Quality piece, but was the wrong size for our wood stove. I needed an oval boot for our 120-year-old side-burner stove! I found one on this web site, shipping was very fast and it fit our stove right out of the box! Fits really well on top of the stove. I am 78 yrs old and inherited this old wood stove from my parents, have had it for 12 years with the missing part, no one locally had the oval to round and said the would have t make one for 100.00. Very happy to have found you! This was a hard item to find in stores and on the web with the exact details I was searching for. The pipe arrived the next business day after ordering and it fit my old potbelly stove like a glove. I will use this company again. This product arrived promptly in the mail. I took the product to my cabin and installed it on my antique wood stove. The oval to 6" round connector fit perfectly. Now I can heat my cabin with wood instead of propane. ProsGreat quality at a fair price!